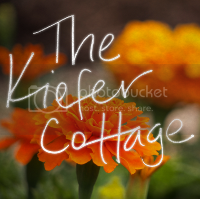 The Kiefer Cottage: We've been awarded! The blogging world can be quite generous, especially with things that don't cost anything. Like blog awards. I've been awarded a couple in the past six months--you haven't heard about them because they take work to accept. You usually can't just say "Yes, I am that awesome, thank you very much." Instead, the award must be passed along to another blogger or fifty. That's where I've gotten hung up. Most of the blogs I frequent are quite well recognized, and who the hell am I, anyway? If I try to bestow an award on someone, would she just laugh at me, pat my head like a good dog, make disdainful remarks about my country fashions, and then turn back to her engaging conversation with Willoughby? It's been too long, though, and I'm ready to return the love even if it means risking my social capital. In the case of Ashley and the Versatile Blogger Award she gave me in...October...I've had this nagging feeling for months that I'm a rude ninny for not doing anything with it. 1. Thank and link back to the person who gave the award to you. 3. Send the award to three additional new/newer/newish blogs - someone who hasn't received the award before. 1. I hate talking about myself. 2. I always tell the truth (see #1). 3. I won a gold medal for the National Latin Exam in 8th grade. 5. I think low fat mayonnaise and sour cream are abominations. And don't get me started on fat-free cream cheese. 6. I willingly purchased a minivan two years ago. I even kind of like it. 7. I almost named my eldest Valentine after the Man from Mars in Robert Heinlein's Stranger in a Strange Land. Yes, I adore science fiction. 1. I have a long lost cousin in Nigeria who has millions of dollars to send me and just needs me to cash this check (which is printed on cabbage, is that weird?) and send him the proceeds and then he'll give me his fortune. It's on my to-do list. 2. I am the top content contributor for realitytvlosers.com. 3. I do an awesome attitude lift at Jazzercise. Seriously, I'm *that* good. 4. I once didn't pass along a chain letter (very similar to a blog award, I might add) and grew an extra finger. Now I have to give this award to three new blogs who haven't been recognized before with this particular prize. That means I can't just turn back around and tell Ashley she's versatile, too (she really is, though! She's working on her bathroom AND tapping her maples for sap this week. How's that for versatility?). The real problem, though, is that I've actually received another award recently! Meg from Nutmeg Place has bestowed the Liebster Award on the Kiefer Cottage. It's also for newish blogs that are diamonds in the rough (yes, me and Aladdin). I'm supposed to share the love with five other blogs now. Balancing My Kitchen by my high school friend Melody. She actually tries to make healthy food contrary to the indulgence you'll find over here. 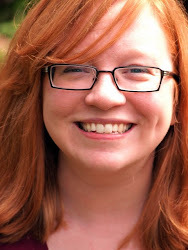 Her blog is brand spanking new. Anywho, happy Liebster Award to Melody! 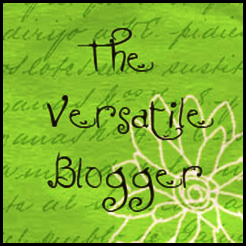 We'll see what pops up over the next few weeks to see if I can spread more blog love. But as I am but a bug in the wide world of the webs, I'm not sure anyone will be butthurt that I haven't recognized more greatness. If you are, please accept my apologies. You're awesome. They really are kind of like chain mail, aren't they?! Err....*chain letter, not medieval military gear. #1 must obviously be true... i had no clue you like science fiction! Haha! You deserve the award! I LOVE reading your blog. I adore your sense of humor!